“Any news in the tech field is like a new landing on the Moon for youngsters, that awakens new passions and endless enthusiasm while supporting the continuous development of digital skills. 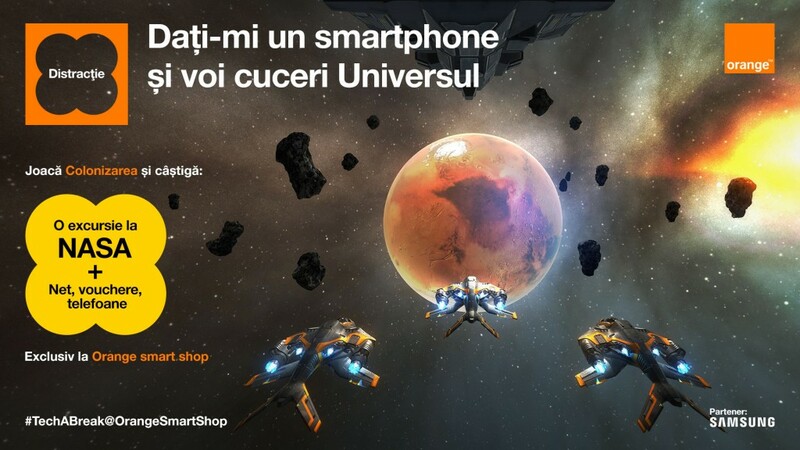 Through the game Colonizarea we thus suggest to youngsters a technology break in the Orange smart shop network, where we have created a unique universe for them, one which helps them test their digital skills in a fun way and win prizes at the same time”, says Laura Piscan, Head of Direct Retail at Orange Romania. “Truth is the possibilities opened by a simple smartphone processor (that has proven to be equally strong or even stronger than a spaceship computer) are infinite. So we created an asychronous, immersive and interactive experience that inspires and opens new perspectives to anyone who visits an Orange smart shop. COLONIZATION really must excite everyone and give them the confidence in technology to make them say ’Give me a smartphone and I’ll conquer the Universe’”, says Elena Negrescu, Senior Copywriter Profero. “As a result, we decided to create each game differently in order to satisfy each ’gamer’, be he a frequent or occasional one, with a fluid Game Design that manages to offer a challenge to anyone, with a learning curve that is rather intuitive. All you have to do is play and lose a few times, so you can get the idea and then become a true stellar explorer”, says Daniel Oprea, Senior Art Director Profero.